A moist and spicy cake that is easy to make! This is a modified version of the famous Orange Cake that was, for me, the Gateway to Vegan Baking. Not only is the recipe simple (no mixer required), but as it turns out, it is also highly versatile. You can substitute almost any juice for the original orange in the recipe with delicious results nearly every time. I made a few additional changes for this Apple Cider Cake. Makes one 8 x 8 inch square cake, one 8 inch round cake, 12 standard cupcakes, or one 8 x 4 inch loaf cake. This recipe easily doubles for a 9 x 13 inch rectangle cake. 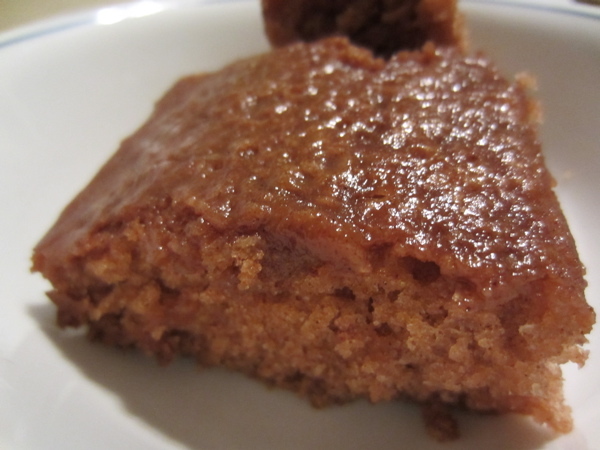 *Applesauce variation yields a cake with a more bread-like texture with all of the flavor and also lower in fat! 1. Preheat oven to 350 degrees F. Grease desired pan with oil, or spray with cooking spray, or line a muffin tin with paper liners. Lining with parchment paper is helpful for loaf pans. 2. Using a whisk, combine flour, sugar, baking soda, salt, and cinnamon in a large bowl. 3. In a large liquid measuring cup, whisk together apple cider, apple cider vinegar, vanilla extract, oil, and applesauce. 5. Pour into prepared pan. Fill muffin cups 2/3 full. 6. Bake for 30 – 35 minutes until a toothpick inserted in the center comes out mostly clean (a few crumbs clinging to it is okay.) Baking time for various pan sizes may vary. Remove cupcakes from the pan immediately and loaf cake from the pan when the bottom is cool to the touch. 7. To make the glaze, sift the powdered sugar and cinnamon into a medium bowl. Add the vanilla and 1 TB of milk and whisk until smooth. Add more milk until the glaze reaches desired consistency. 8. When the cake is cooled completely, pour the glaze over the cake. Refrigerate the cooled cake if not eating immediately. This cake is best enjoyed the day after baking, and the flavor continues to improve after that. 4 Responses to "Apple Cider Cake with Cinnamon Glaze"
I’m also a big fan of that “famous orange cake” recipe that Slynn introduced me to a number of years ago. I have alternatively made it with almond milk as the liquid, lemon juice and water as the liquid, and with pineapple juice and crushed pineapple. It goes well with a frosting or a glaze. For me, this recipe made 16 cupcakes, and they are terrific. They’re moist & tender, just cinnamony enough, and don’t need the glaze. Next time I’ll reduce 1 1/2 cups of cider to 1 cup to concentrate the apple flavor. Looks like the link to the original Orange Cake recipe has changed: http://familynature.ca/orange-cake-vegan-or-not-youll-love-this/. I definitely recommend trying that one too if you haven’t already.